Have you ever wondered whi'h of the 50 states best suits your personality? Take this quiz to find out! Were you born in a state that mat'hes your personality? Or would you have been better suited for a different state? Answer a few questions and we'll tell you. Do you belong in a fun, tropi'al state like Hawaii, or a pea'eful pla'e like Colorado? Do you want to be 'lose to the hustle and bustle like Maryland? Or maybe you're looking for some pla'e a little more private, like Alaska? 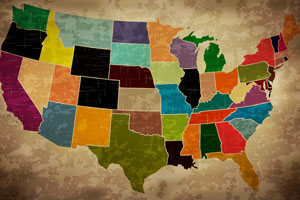 Take this fun quiz and find out in whi'h of the 50 states you should have been born.